Borderlands Theater- Presents BORDER’S EDGE & El Ausente at Global Justice Center & blu at the University of Arizona! 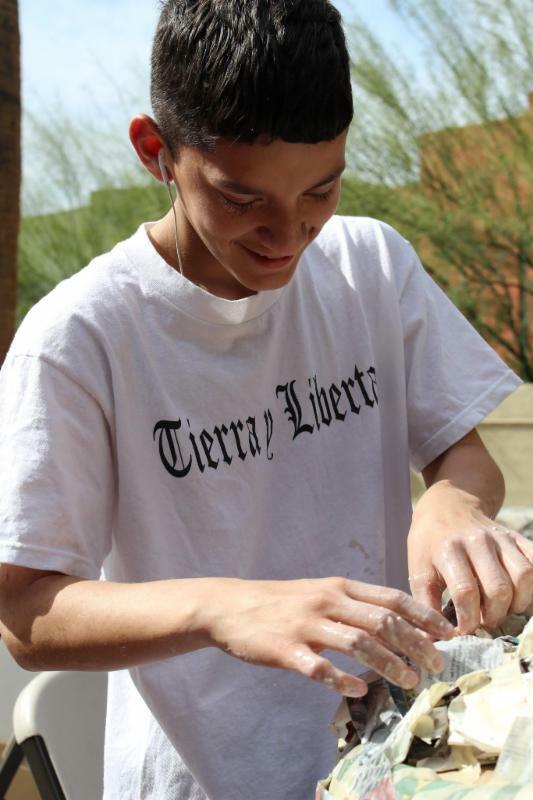 Borderlands Theater– Presents BORDER’S EDGE & El Ausente at Global Justice Center & blu at the University of Arizona! Border’s Edge Happening Next Week! blu at the U of A! First Puppet Making Session a Success! Border’s Edge “Happening” Next Week! latest venture, Border’s Edge: On the Edges of Performance. The stellar showcase features a mind-bending, interdisciplinary, multimedia experience with performers, as living museum pieces, taking over the outdoor courtyard of Borderlands Theater’s office building. Performance artist Denise Uyehara will dawn a giant paper kimono with twenty foot long arms as part of a piece called Jomon/Jámon which examines Okinawan identity and authenticity. Milta Ortiz explores marriage and feminine identity in her experimental performance piece.Natalie Nguyen and Selena Tang of Flight School Acrobatics perform a duet called Double Crossers that plays with twins, acrobatics, and the Asian female action heroine archetype. Interwoven throughout the night, spoken word poets Enrique Garcia and Logan Philips read from their recently published books, Tortoise Boy Says and Sonoran Strange, respectively. 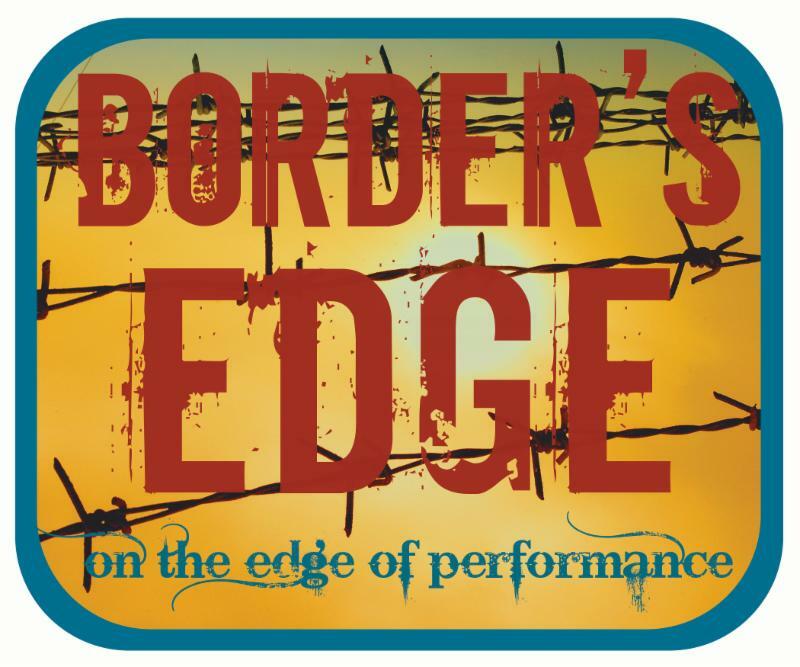 Border’s Edge is a fundraiser for Borderlands Theater. All performers have generously donated their time and creative efforts. El Ausente at Global Justice Center! Pay what you can. Spread the word! 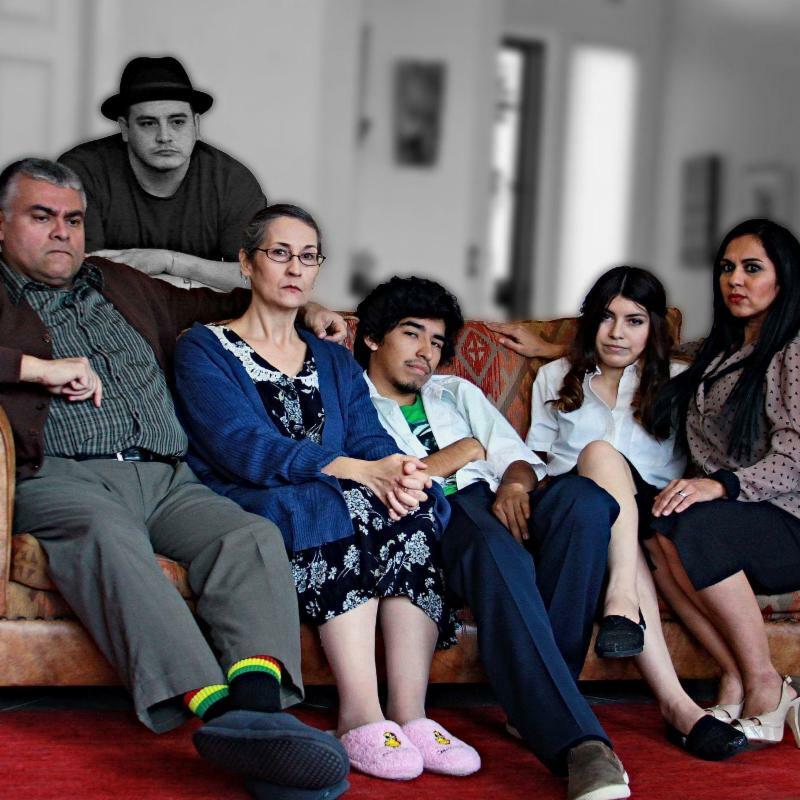 Pablo migrates from Mexico City to the USA, leaving his elderly parents to care for his wife and two children. El Ausente / Absence uses subtle humor, a genre seldom used in plays about migration, to explore the question of what happens to those left behind. Por favor llame a la Oficina de Boletos (520)-882-7406 con cualquier pregunta. blu at the University of Arizona! Producing Director Marc Pinate directs Virginia Grise’s blu, which plays 4 nights at U of A’s School of Theatre. Virginia Grise’s vital, cultural play, “blu”, opens Thursday, February 26th, at 8pm, & runs through Sunday’s matinee, March 1, at 2pm. Tickets are ridiculously affordable at $7 each & all seats are VIP in a 66-seat theatre. There is a post-show discussion with cast members after each performance & they are guaranteed to be riveting. Plus, playwright Ms. Grise will be at opening night! 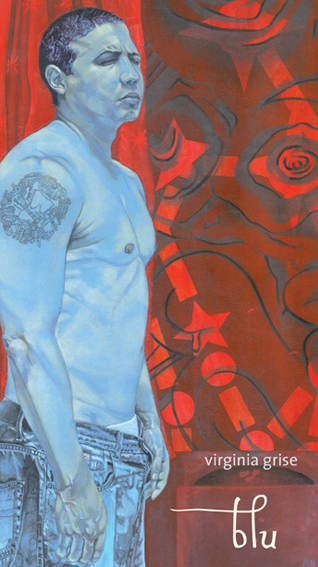 The entire run of “blu” is dedicated to the memory of esteemed UA professor & colleague, Richard Ruiz. For parking information and more details, visit the play’s Facebook pagehere. First Weekend of Puppet-Making Sessions a Success! 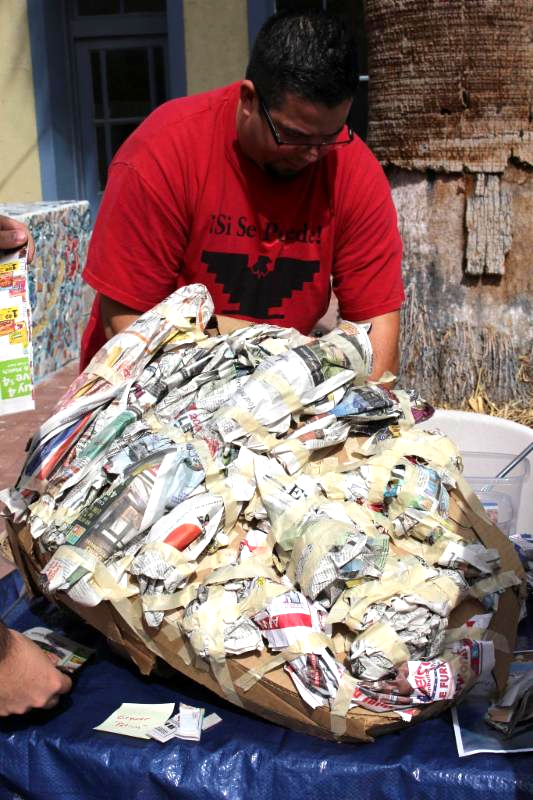 Big thanks to Luke Salcido for bringing his students from the Teen Cuisine program, Pueblo High School Mecha, and Las Adelitas for volunteering the first weekend! 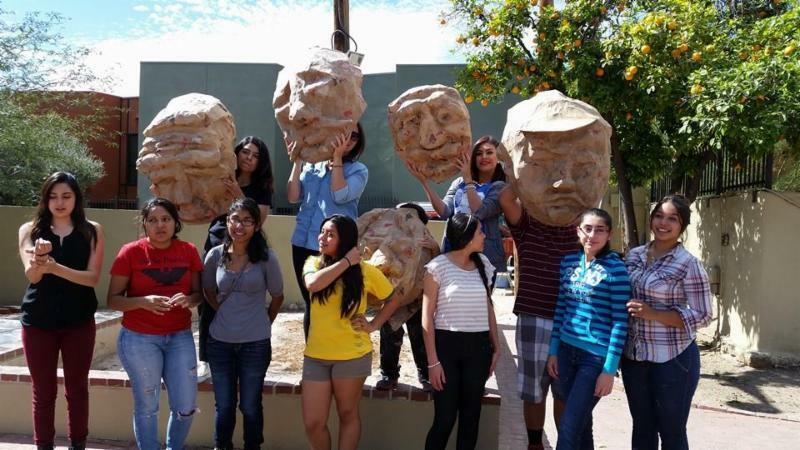 We had 12 young men and 10 young women come through, making the cabezudos for the Cesar Chavez March. A big thank you to Susan Furr from Tucson Puppet Artists Guild for facilitating, and to Gabi Hurtado, our fabulous intern, for making sure everything went as planned.